My Lady is always a goin’ on about stayin’ healthy and eatin’ right. She also says that us furbabies are part of the family and so we gotta stay fit and healthy too! I’ll be the first to admit I’ve been packin’ on a few pounds. That girlish figure slipped right away ‘fore I knew what was a happenin’ to me. I’m not the only one though! Lookin’ around at my brothers and sisters, looks like we all been livin’ a little high on the hog! To many treats and nap takin’ on the comfy couch has got our waist lines a spreadin’ faster than a river risin’ in a flood! Ain’t no doubt we been eatin’ mighty good. These days we’re eatin’ healthier and exercisin’ more. My Lady says it’ll help us live longer and be healthy and happy. I’m already happy and I reckon I want be healthy too! To help us become healthier, we’ve been chowin’ down on a different kind a food called Purina Dog Chow Light & Healthy that has less calories in it. It’s from the Nestle Purina folks! My Lady had already been singing their praises, so of course when she got a chance to talk about it with y’all she said yes! We’ve also been doin’ extra exercise time. My Lady’s like a drill sergeant ’bout that exercise time! Some days I’d rather just keep snoozin’ on the couch, but there ain’t no slackin’! She’ll poke and prod until we get up and out the door! I have to admit though, we’re feelin’ healthier and happier! Oh, and that there food is lip smackin’ good! WOOF! My Lady is nipping the problem in the bud with us, but she says you’d be surprised at the folks don’t know their furry friends are overweight. I’m gonna let my Lady tell ya about a few statistics from a study that was done. I know she’s gonna share all our dirty laundry in the process eek! I may be a redneck girl, but really now! What girl wants her weight troubles posted for the world to know GEESH!? Ain’t no use puttin’ it off, so I might as well turn it over to her. 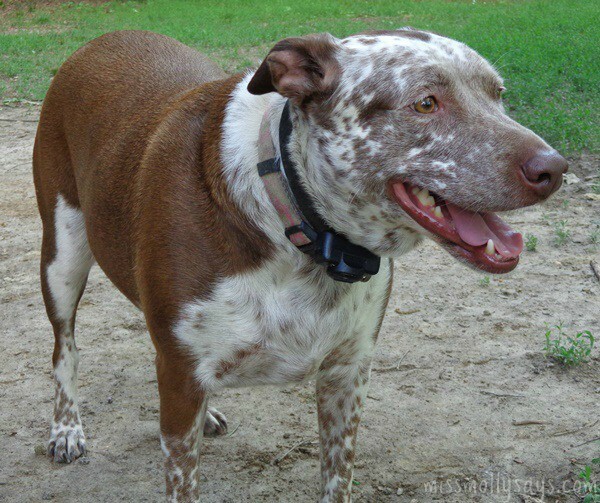 I’ll just mosey on over here and let my freckles turn red! Recently there was a nationwide survey conducted by Purina Dog Chow Light & Healthy about dog owners perception of their pet’s weight, management, exercise and feeding habits. I feel the results hit the nail on the head – so to speak. The survey identified a gap between owners who understand and acknowledge their pet’s weight problem, compared to the actual number of dogs that are overweight. This simple finding spoke volumes to me as a pet owner. With several dogs of my own, my main concern has always been to feed them, as in – feed them well (maybe a little to well) with a good nutritious food. They also are on the receiving end of quite a few treats. Yep, they’re spoiled! At some point, I started to realize a few were really getting quite round and fluffy! To know before this point is the trick. • 85% of dog owners surveyed believe they have an understanding of the nutritional guidelines that should be followed for themselves, 76% of dog owners surveyed believe they have an understanding of the nutritional guidelines that should be followed for their dog. • 22% of dog owners surveyed believe their dog is overweight. This is in stark contrast to the reality that 53% of US dogs are actually overweight (as reported by the Association for Pet Obesity Prevention1). Whew! While the survey shows almost the same rate at understanding nutritional values for humans and their pets, the question of knowing IF your dog is overweight or not, shows a huge difference! That leads to question of HOW DO YOU KNOW if your pet is overweight? Do you know how to determine the healthy weight of your dog? • 85% of dog owners surveyed believe they know the correct signs to determine if their dog is a healthy weight. • 41% of dog owners surveyed rely on their veterinarian to determine if their dog is overweight. I will be honest and say I never really thought about it until I started having to wait on a couple of them to ‘haul themselves up’. They were starting to waddle and jiggle like jello. Of course by this point, I knew they were on the hefty side. Then came the gentle reminder, and then the stern reminder, from my vet that I needed to cut back on the treat supply! It was our wake up call! 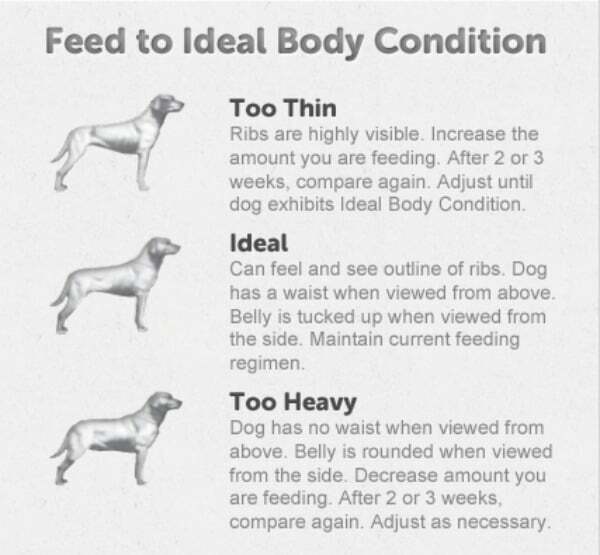 What is ideal body weight for a dog? Here’s a simple test you can do at home to to give you an idea on where you’re pet is. You’ve done the test. Now what? Do you know how to manage weight? • According to 36% of dog owners surveyed, ‘fed my dog smaller portions of the same dog food’ is the first action they took to manage their dog’s weight. Let’s be honest here. Feeding your dog LESS is just NOT GOING TO HAPPEN, at least not with me. The moment they turn those big sad eyes on me and look at their bowl, I am butter in their hands! So, feeding less food is just not going to work! • 16% of dog owners surveyed who feed their dog a low calorie diet believe their dog does not enjoy its low calorie food. • When asked why they aren’t feeding a low calorie dog food, 40% of dog owners surveyed believe their dog will not like the taste. Again, I will be the first to admit I had the thought that low calorie food may not taste as good. Sometimes us humans reflect on our experience. Perhaps at some point we have tried diet food and the taste was sorely lacking. But then other times, diet foods can actually be really tasty. It’s the same for dogs! I was reflecting my thoughts and experiences onto them without even giving them a choice in the matter! When we made the switch to Purina Dog Chow Light & Healthy, I really had an eye opening experience! Above all else, I want my dogs to be healthy and happy. While several of my dogs are about the right size and maybe starting to head in the direction of to many pounds. A few more pounds and that’s exactly where they will be at. But, I have three – including Miss Molly (don’t tell her I said that!) – that can definitely stand to lose a few pounds! 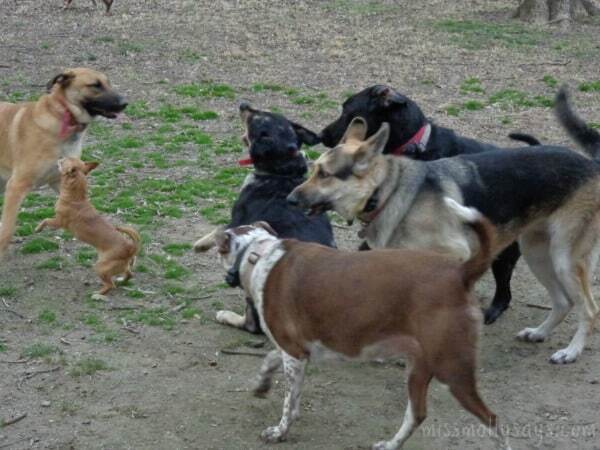 What is Miss Molly and the pack doing to stay fit and healthy? I made the decision to switch to Purina Dog Chow Light & Healthy for the whole pack (except one that is under a vet’s care and on a prescription diet and my senior girl with the stomach issues). So, with my pack, that leaves 5 dogs that I switched to Purina Light & Healthy. Now, if low calorie food is suppose to taste bad, something went wrong! When I got the Purina Dog Chow Light & Healthy I was thinking – ok, low calorie, it might taste bad, they may not like it, they may reject it – nope, not a problem! Actually, it was opposite! They LOVED it! All 5 of my dogs devoured their meals and haven’t slowed down yet. Who says low calorie food has to taste bad? They LOVE IT and I am tickled to death that they like it! It is lower calorie and will help in our mission to keep them healthy and happy! Low calorie food is working so much better for me than trying to cut back and feed them less. Cutting back just wasn’t working at all! 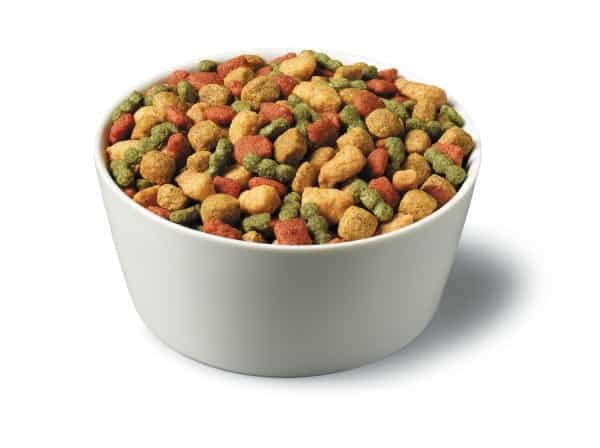 The Purina Dog Chow Light & Healthy contains 20 percent fewer calories than Purina Dog Chow Complete & Balanced, and includes a tender and crunchy kibble blend.It is steam-cooked at the start, and is made with high quality protein sources including real chicken. Its Light in calories, big on taste. My dogs certainly will agree to big on taste! I don’t know what those little green nuggets are but Brandi LOVES them! She digs them all out and eats them first! It’s quite hilarious! While we’ve always gone pretty much by portions recommended, it is recommended to use an eight ounce measuring cup to ensure you are providing them with the correct portion at each meal. We have also increased exercise time! In addition to the lower calorie food, we have stepped up the daily activities and exercise routines. While we don’t have anything in particular we do besides a few training sessions, I do make (and I stress – make) them go out and play every day. Given their choice, they would stay under the air conditioning and at my feet napping! I go with them and we play fetch or work on some extra training routines. Most days, and since we have almost enough pups for our own doggie baseball team, I let them run, chase, wrestle and have their boxing matches. It’s unstructured play that they enjoy, but they are also burning calories and energy! 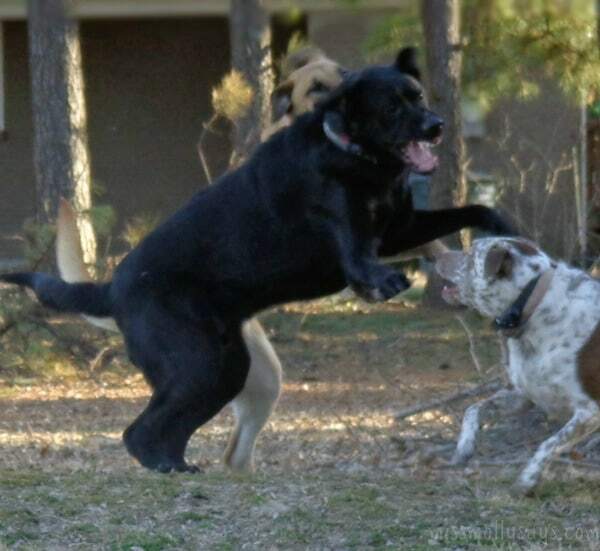 They have a grand time, running, racing, chasing each other from one end of the property to the other and ending in their favroite -a huge wrestling match. Even the little chihuahua joins in! 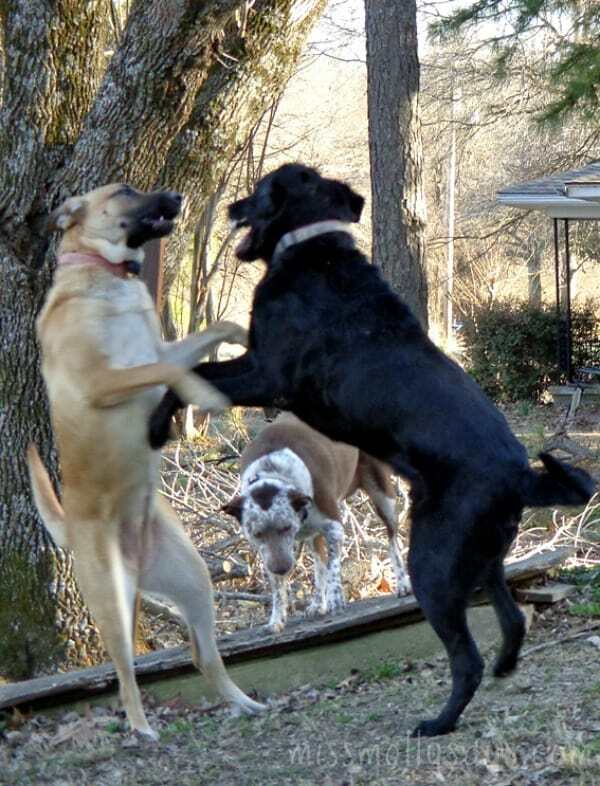 Brandi and Ozzy love to have boxing matches on the cellar hill and Miss Molly acts as referee! Uh oh! Ozzy didn’t like Molly’s call and is letting her know about it! Miss Molly better run! She does, and that leads to another game of chase! Then, it’s finally time for another lap through the woods before we head in to eat. 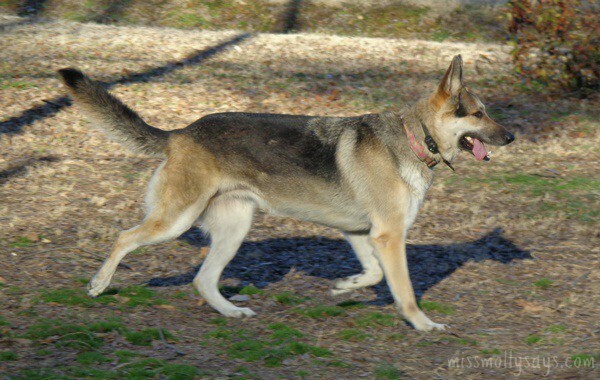 Maggie’s tongue is hanging out, but she’s striding comfortably through the back of the of the property. She’s almost to the yard. Looks like Ozzy and Brandi cheated and took a shortcut! They’ve already made it to the yard. But, they look pretty tuckered out, so I’ll give them a pass this time. Molly and the rest of the pack will be here in a bit. As you can see, all the pups get plenty of running time and you can bet I love watching them run off that boundless energy! You can also bet they will sleep good tonight! When it comes to exercise, any activity is good! It doesn’t have to be structured or anything fancy. 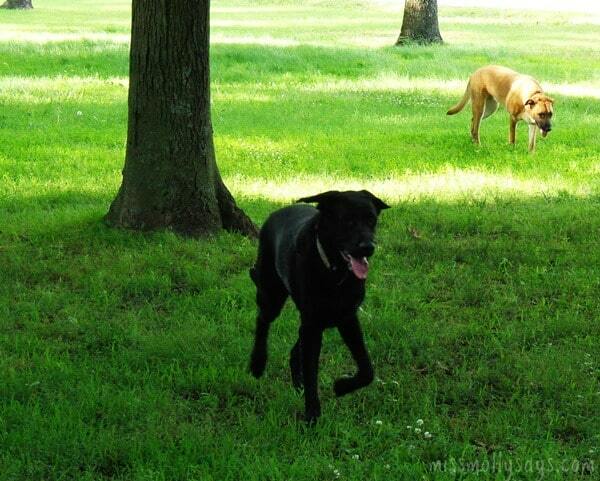 It can be as simple as long walks, runs or a game of fetch or frizbee. As long as they are moving and enjoying themselves. It will help burn calories and keep them fit! Anything, except the exercise of counting zzz’s on the couch! You have to get them moving! 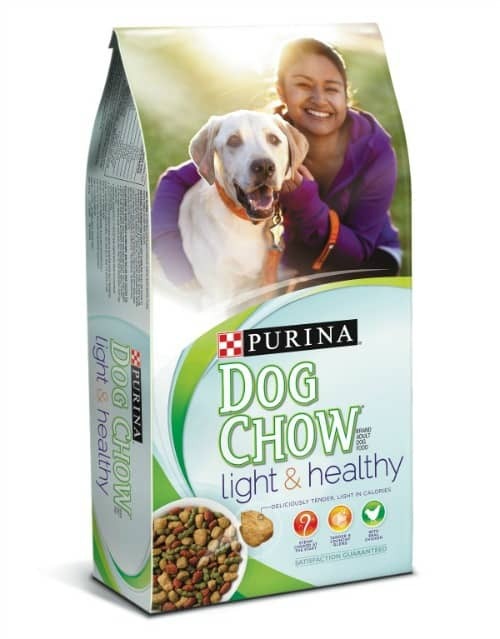 Purina Dog Chow Light & Healthy Coupon Savings! I love the fact that healthy high quality low calorie food doesn’t have to cost you and arm and leg! Purina Dog Chow Light & Healthy is sold at an affordable price, right in line with other Purina brand dog foods. If you would like to give it a try for your dogs, grab this printable coupon to save $2.00 off Purina Dog Chow Light & Healthy (offer good while supplies last)! Miss Molly and the pack are still some pretty spoiled furbabies, BUT, these days they are eating healthier with their Purina Dog Chow Light & Healthy, exercising more and becoming fit AND healthy! I want the best for my furbabies and I believe they are healthy. Their coats are shiny, their eyes shine with health, you can see they are full of energy and those smiles just tell it all! I believe they love being fit and trim! We keep ourselves fit and healthy and I believe we owe it to our pets to make sure they are fit and healthy also! Just a note, and you probably already know this, but Purina Dog Chow Light & Healthy would not be for female dogs that are in gestation or lactating. Exercise with your dog and get healthy together! Have you ever thought about exercising with your dog? The next person who will be posting about keeping your dog healthy is Marcia from Marcia’s Healthy Slice! Make sure to check out Marcia’s Healthy Slice next week for tips on exercising with your dog and the importance of weight management! I was provided with coupons and product above from Nestle Purina. No other compensation was received. All thoughts and opinions stated here are 100% my own. What a beautiful pack! This was a great post. I had not thought too much about weight management and dogs, but obviously we have to watch their waste-lines as well as our own! Thank you! And, yep – they have a tendency to gain weight just like we do unfortunately. I enjoyed reading your blog. Thanks for providing this information.